Creating a project plan from scratch but don’t know where to start? Our tips and template can take you from plans to action. These days, anyone can end up managing a project—even if that’s not their official title. Traditional project management software can be difficult to use, meaning teams turn to spreadsheets and email. Yet their simplicity gets quickly overshadowed by time-consuming manual work, long email threads, and hard to find information. 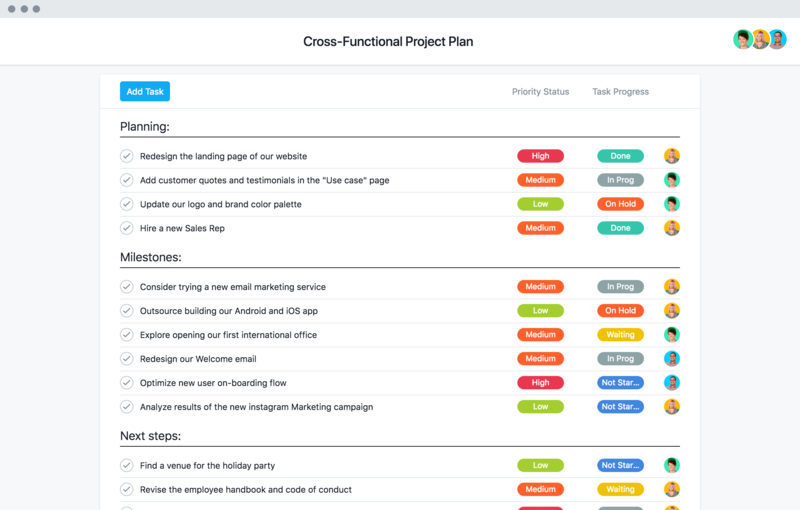 With Asana and one of our project templates, you can make your project plans, goals, communications, and files clear and accessible in one place. Plan your project on a timeline. Making sure you can hit and visualize your deadlines is key to a successful project. You can visualize all your dates and dependencies in a Gantt-style timeline—and move them around if plans change. Organize and prioritize your to-dos. Not all tasks are created equally, and without a way to quickly see priorities or related work, things slip through the cracks. Our template gives you fields to organize and sort your work. Communicate clearly in the right channels. Email can be where plans and productivity fall to the wayside. Planning with our template keeps conversations in context so specific task questions and progress updates go to the right people in the right place. Start your project with our template, then master project management with these strategies. New to managing projects or Asana? Get started with a quick video tutorial. What could your team achieve if it were 45% more efficient? Find out with a free trial of Asana Premium.